In this tutorial we will explain you the basics of Google Charts and all the basic components of Google Charts with suitable examples. This tutorial is useful for Software Professionals who wish to learn Google Charts in simple and easy way. 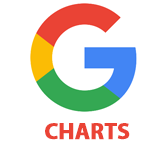 This tutorial gives good understanding on Google Charts concepts and after completing this tutorial you will get an intermediate level of expertise from where you can take yourself at higher level of expertise.